Features writer Bill Spurr talks with cartoonist Michael de Adder about finding the funny side of East Coast foibles. On November 7th, the Tate Gallery will publish Comics Art, a new book on the comics form by Paul Gravett, designed by Peter Stanbury. 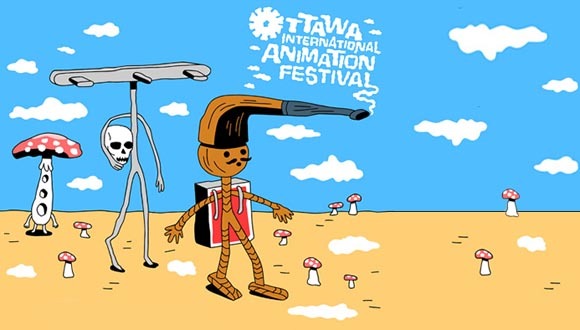 North America’s biggest animation festival, the Ottawa International Animation Festival, will take place in Canada’s capital city from September 18-22. 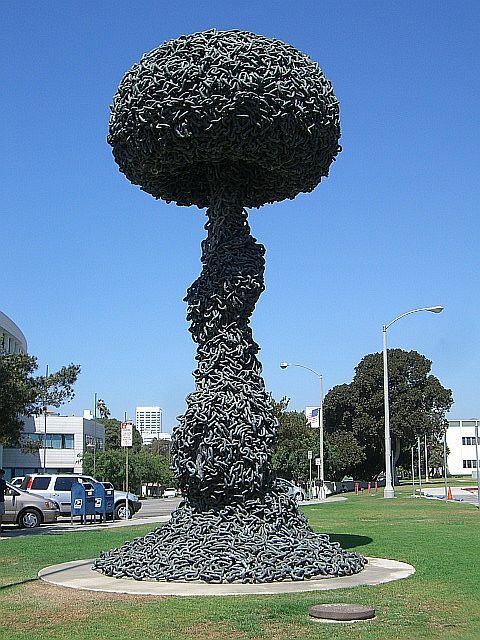 Paul Conrad's 'Chain Reaction' remains a vital message and safety concerns have been debunked, so why is Santa Monica determined to dismantle the sculpture? 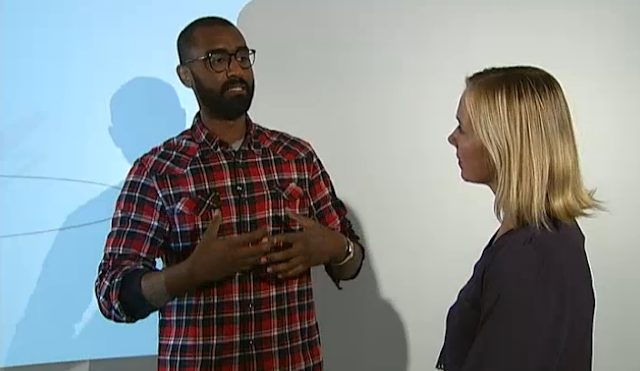 UK's Channel 4 has broadcasted a report on the Arab uprisings and the role of cartoonists, featuring an interview with Khalid Albaih, and also showing the work of Doaa Eladl. Matt Wuerker, Politico, will also serve on the 2013-14 Board as Immediate Past President. Randall Enos Revives "Chicken Gutz"
Randall Enos, whose comic linoleum cuts graced the pages of magazines and newspapers everywhere, was known for a crazy, gag-riddled comic strip called “Chicken Gutz” that first appeared in the January 1972 issue of the National Lampoon and ran in each issue for about 12 years. 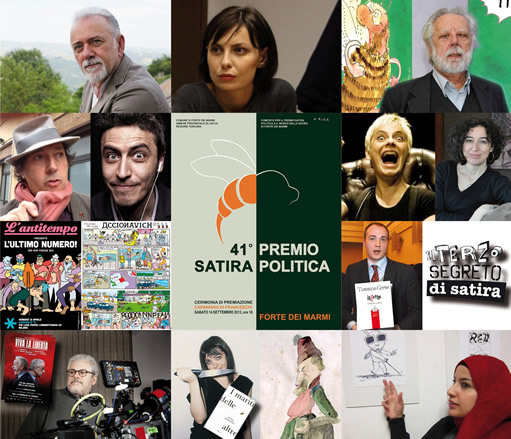 Today the "Oscars" of Italian satire are being awarded in Forte dei Marmi. Italian cartoonist Marilena Nardi and Egyptian cartoonist Doaa Eladl are among the political satirists honoured. Pooch Café hits 5000th Strip! "Holy snap. I can feel the bones in my drawing hand creaking. I had to do the calculation three times. I had to use an abacus, because apparently those were all the rage around the time I started drawing this strip, which debuted on Jan 3, 2000, (“The first strip of the new millennium”, I coined it). It coincided relatively closely with Charles Schulz’s announcement that he was retiring Peanuts, and I was quickly misquoted in a newspaper interview as calling Poncho “the new Snoopy.” My first reporter twisting of words! I had entered the public eye. "Marvellous! Thanks to Fukushima, sumo is now an Olympic sport." Japan is to lodge an official complaint about a cartoon in a French newspaper that links the Fukushima nuclear disaster with Tokyo's successful bid to host the 2020 Olympics. 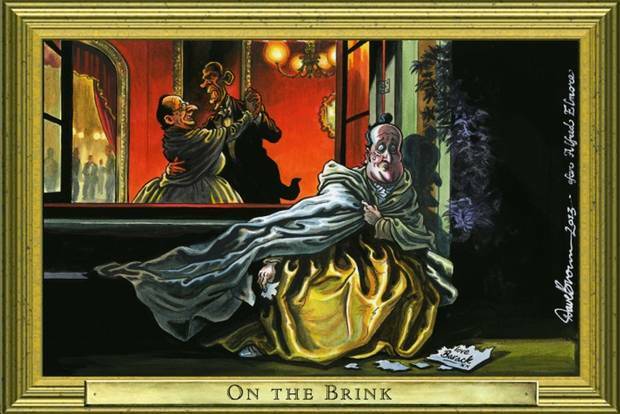 The Cartoon Cafe in Eastbourne will be showing 40 of Dave Brown‘s art-inspired Rogues’ Gallery cartoons, from October 5 until January 20, 2014. 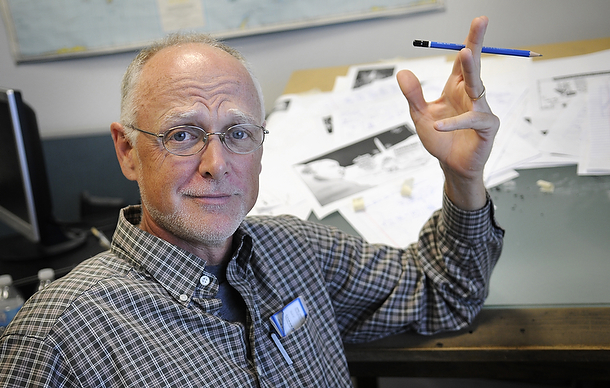 Joel Pett just turned 60, and he has spent a lot of time lately going through his three decades of editorial cartoons for a retrospective exhibit at the Carnegie Center for Literacy and Learning. 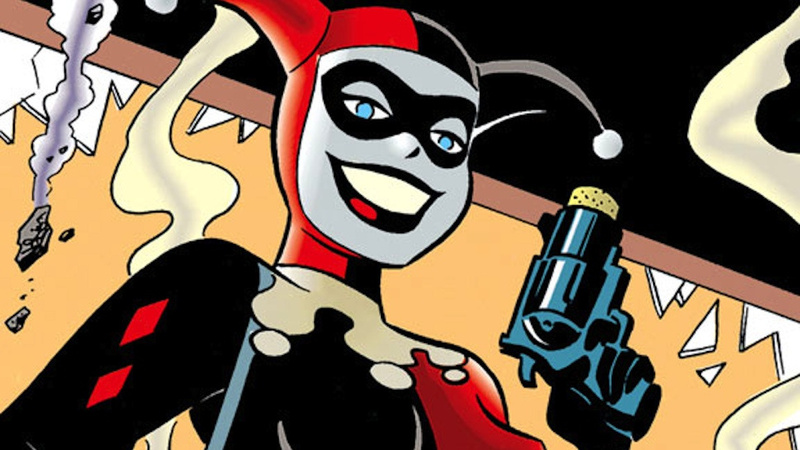 DC Comics has been having a bad week. Last Thursday, two members of the Batwoman editorial team quit after their publishers refused to allow Batwoman (who is a lesbian character) to marry her partner. And now the comic company has provoked even more outrage by hosting a contest in which they readers to draw Harley Quinn, a popular villain, preparing to commit suicide. Naked. If you have been delighted or moved or provoked by a New Yorker cover in the past two decades, you’re familiar with the genius of Françoise Mouly—though you likely don’t know it. As the magazine’s art director and visual editor since 1993, when new editor Tina Brown hired her to enliven the then-fuddy-duddy publication, Mouly is responsible for a parade of images seared into the cultural imagination: a Hasidic Jew kissing a black woman created by her husband, Art Spiegelman, in 1993; the black-on-black depiction of the twin towers she created with Spiegelman just hours after 9/11; her 2004 cover depicting the American ﬂag stained by the shadow of a tortured Abu Ghraib prisoner; Barry Blitt’s ﬁst bump between the Obamas in 2008 and, more recently, John Cuneo’s depiction of Anthony Weiner sexting astride the Chrysler Building. 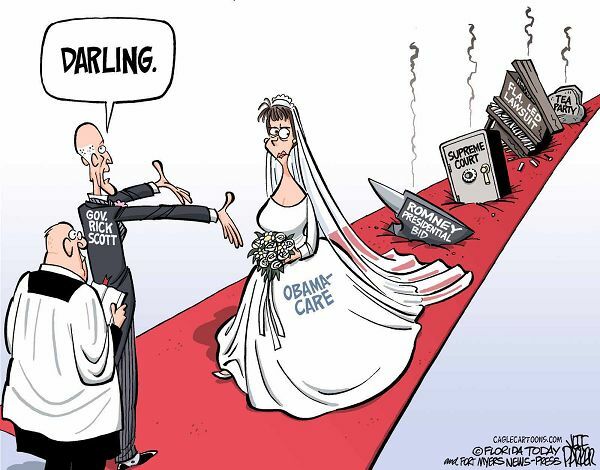 From the Robert T. Peters blog. I designed this poster in 2005, as one of 24 individuals invited to contribute to Lest We Forget: Canadian Designers on War, an exhibit at the Citadel Theatre in Edmonton, Alberta. 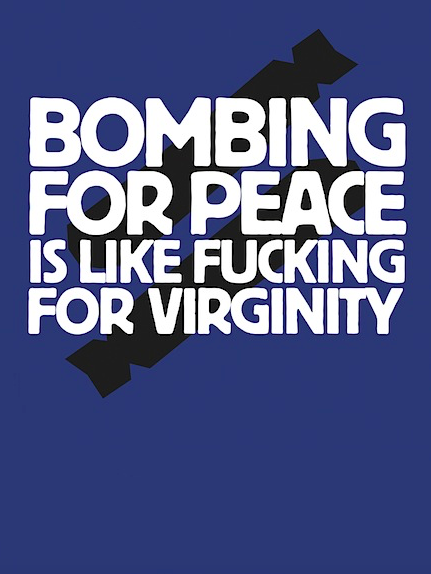 I first saw the ironic message on a photograph (shown below) of two women participating in a San Francisco peace rally in 2003 on the eve of the U.S.-led war on Iraq. 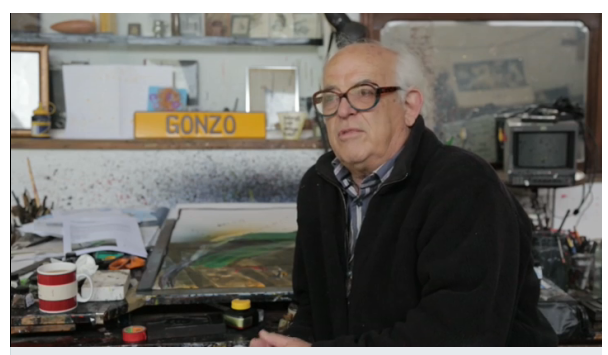 A short interview with cartoonist Ralph Steadman here. You can visit his current exhibition "Steadman@77" at the Cartoon Museum in Little Russell Street, London. "VIP: The Mad World of Virgil Partch"
Fantagraphics has made available a 26-page PDF preview (download here) of their forthcoming Virgil ‘VIP’ Partch retrospective book that confirms this will be one of the must-have cartoon-related books of 2013. The preview will be of particular interest to readers of this site as it contains gag cartoons and other assorted drawings from Partch’s Disney animation years. 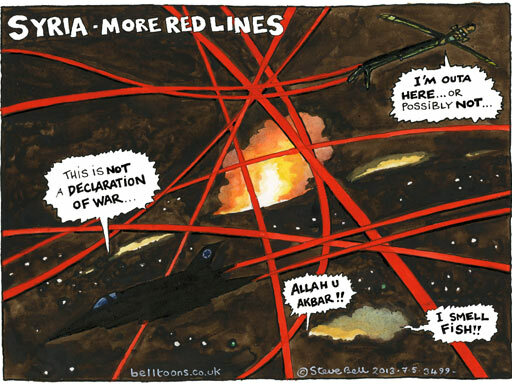 Cartoonists the world over have seized on Obama's "red line" declaration about the use of chemical weapons by Syria's al-Assad. 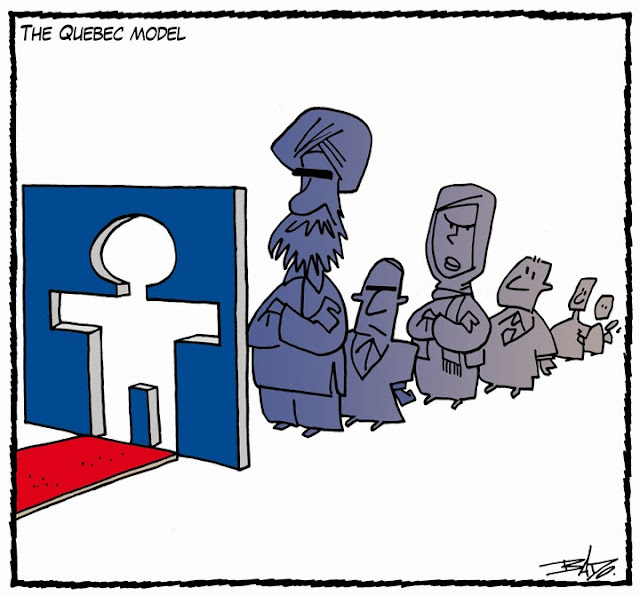 Born in Montreal in 1949, Guy Badeaux (Bado) has been the editorial cartoonist at the French language daily "Le Droit" in Ottawa since May 1981. 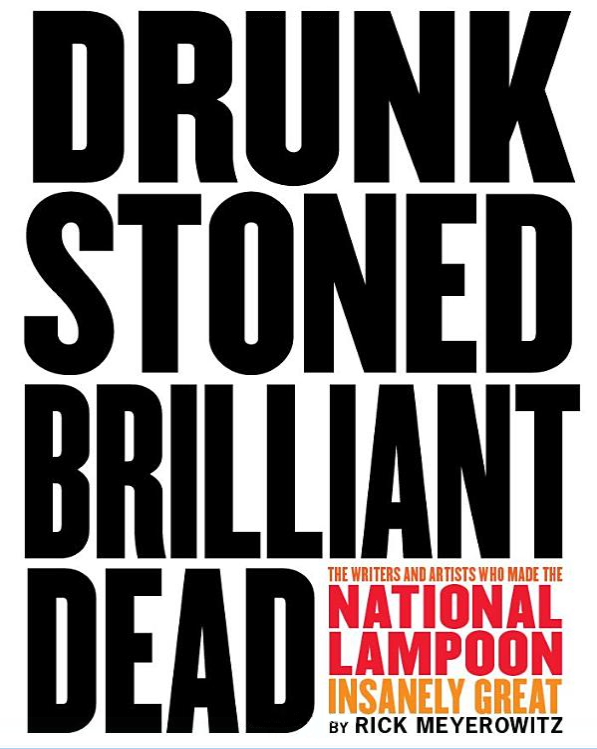 Winner of the National Newspaper Award in 1991, he is a member of the group "Cartooning for Peace" as well as treasurer of the Association of Canadian Cartoonists. Since 2002, he has served as president of the jury of the cartoon contest of the Canadian Committee for World Press Freedom in Ottawa. 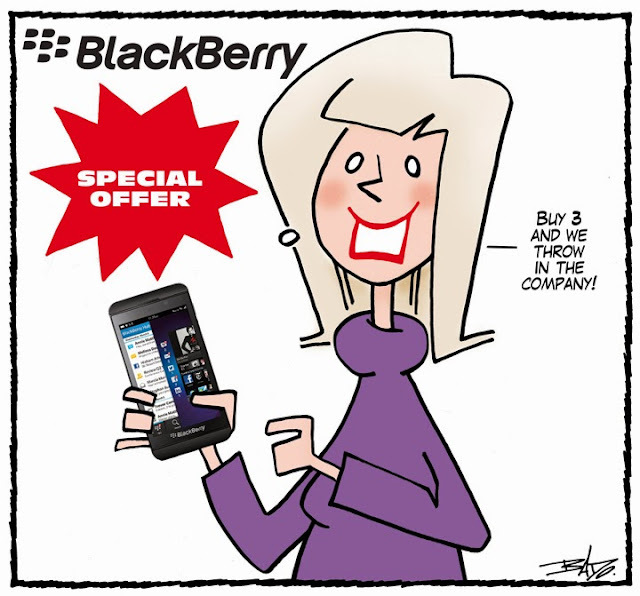 He was also editor of the 22 first issues of "Portfoolio: The Year’s Best Canadian Editorial Cartoons". Qui ça, bêtes et méchants? Éditions David, Ottawa, 2016. Vous êtes en feu!, foreword by Raymond Saint-Pierre, Éditions David, Ottawa, 2014. 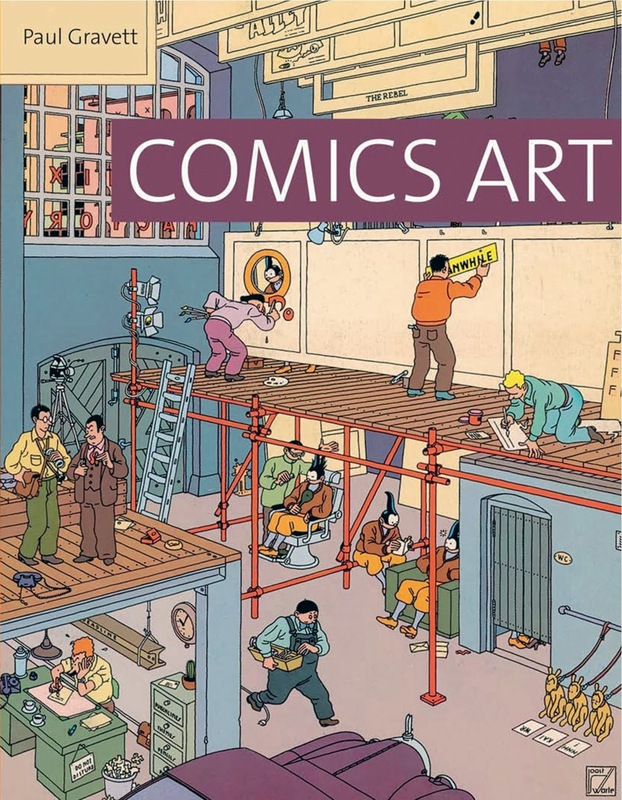 Sans dessins du Prophète, foreword by Plantu, Éditions David, Ottawa, 2011. Bado 2004 et même plus!, L'Interligne, Ottawa, 2004. Tout a changé le 11 septembre, L'Interligne, Ottawa, 2003. Salades du chef, foreword by Pierre Légaré, L'Interligne, Ottawa, 2000. 1997 ne sera pas Jojo, foreword by Michel Vastel, Vents d’Ouest, Hull, 1997. Les années 90, foreword by Michel C. Auger, Prise de parole, Sudbury, 1993. La jeunesse d’aujourd’hui, foreword by Robert LaPalme, Asticou, Hull, 1988. Ça va fumer!, foreword by Pierre Huet, Croc, Montréal, 1984. Tout Bado ... ou presque, foreword by Jean-Guy Moreau, Baloune, Montréal, 1979. "Well, of course I did it in cold blood, you idiot! ... I'm a reptile!" From The Washington Post . 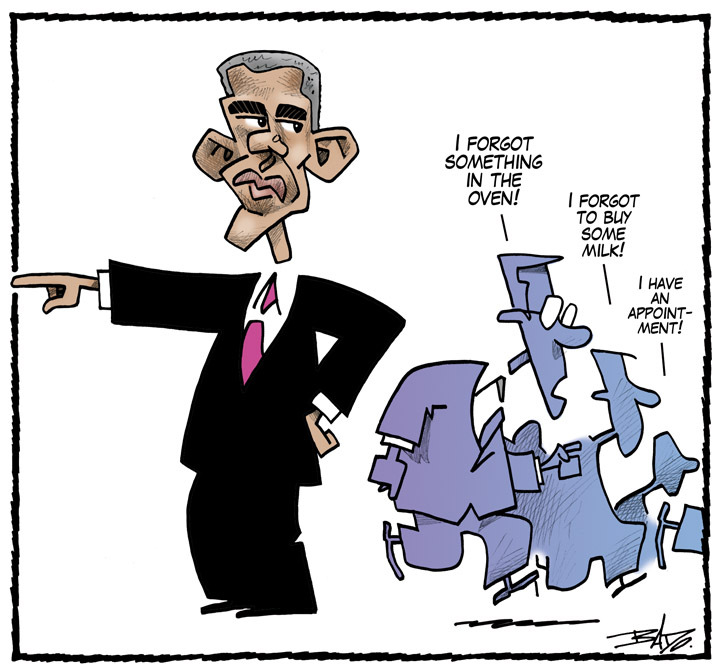 Darrin Bell receives the 2019 Pulitzer Prize as a cartoonist for The Washington Post Syndicate. Né à Montréal en 1949, Guy Badeaux (Bado) est caricaturiste au quotidien «Le Droit» à Ottawa depuis mai 1981. Lauréat du Concours canadien de journalisme en 1991, il est membre du groupe "Cartooning for Peace" de même que trésorier de l'Association des caricaturistes canadiens. 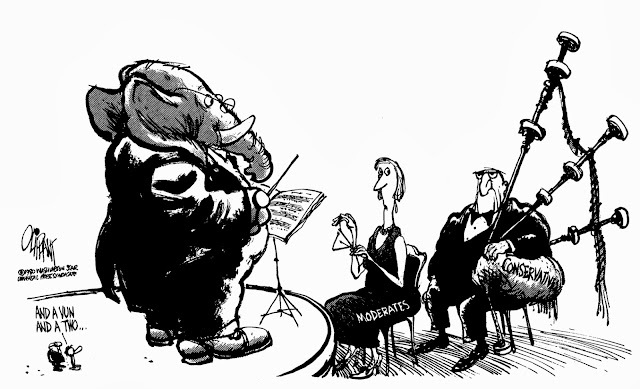 Depuis 2002, il est président du jury du Concours de dessin éditorial du Comité canadien de la liberté de la presse à Ottawa. 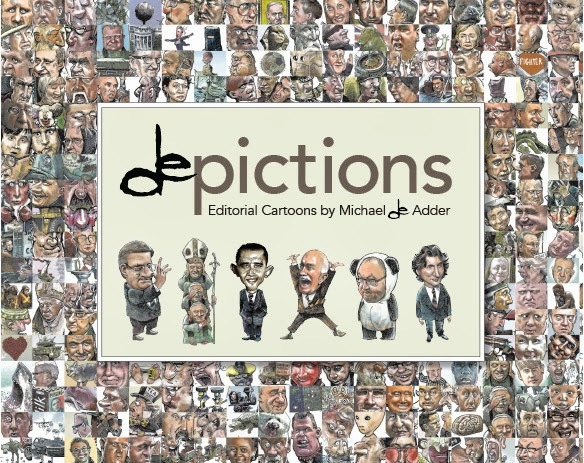 Il a également été rédacteur en chef des 22 premières éditions de "Portfoolio: The Year’s Best Canadian Editorial Cartoons".